Description: The RX Series with a reliability rate of over 97% can work in most adverse of conditions without problems. The RX Series with a reliability rate of over 97% can work in most adverse of conditions without problems. Tackling difficult loudspeaker loads, and abnormal power conditions is one of the design criteria of this series. These Quatret of amplifiers are very stable at 2 ohms. Very good savings are realized with an unique added feature -the built-in crossover to make the amplifier a subwoofer amplifier or a midhighs amplifier, besides being a full range device of course, therby eliminating the need for external crossovers and simultaneously ensuring, easy, no complication, safe operation even if a novice is handling the setup). 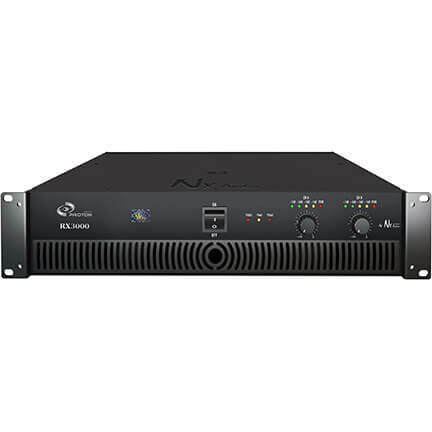 The RX Series Amplifiers can be used with any loudspeaker system, but if you're using our Y & X Series Speaker Systems, they will provide power and performance tailored to deliver maximum performance from your system. 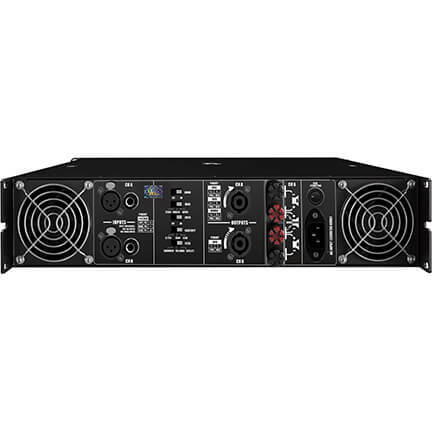 In an 2-ohm stereo application RMS power output per channel on the RX3000 is 1250 watts. This wide selection lets you choose the amplifier that best matches the power handling capabilities of your speaker system. All four models are usually sold in pairs as they are equipped with high and low pass filters, so you can optimize output for subwoofer or full range systems to provide peak audio quality and performance from any speaker system you may be using. To provide the most flexible connectivity possible, all four models are equipped Speakon output jacks, and 1/4-inch output jacks for each channel in addition to 4-way binding post. Channel inputs consist of both XLR and 1/4-inch TRS jacks. Of course all the other functional features like comprehensive protection, temperature controlled fans, bridging ability among a host of other features, ensure that the Proton RX Series is truly the audio all terrain vehicle. Oh we almost forgot, it costs much less than all its competitors in its class. Those on a budget will find the lineup's high power output and very affordable prices deliver a much higher quality without putting a strain on funds.